The standard shell and tube graphite heat exchangers comprises a steel shell enclosing a graphite tube bundle fitted with end covers. Because of the differences in their coefficients of thermal expansion, (steel expands 2-3 times as much as graphite) the differential expansion between the steel shell and the graphite tube bundle is taken up by the externally packed floating tube sheet. This compensate expansion and contraction of the shell over the graphite tube bundle. The graphite tube bundle is held in the shell by the stud holding the fixed tube sheet to the fixed end shell flange. These bolts remain in place to ensure that the graphite tube bundle is restrained whenever the graphite heat exchangers is in service, or subjected to pressure testing, or whenever the graphite heat exchangers is moved. The fixed end cover is fixed to the fixed tube sheet by the stud between the pressure plate and the fixed end shell flange. The floating end cover is held against the floating tube sheet by the stud between the pressure plate and the floating tube sheet flange. This flange holds a split ring, which is located in the groove in the floating tube sheet. Floating Head Sliding Gland seals the shell and floating tube sheet employing a stuffing box. 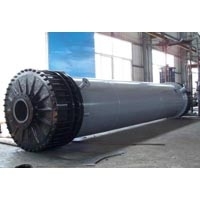 On this basis, shell and tube graphite heat exchangers are used as graphite heaters, graphite coolers, graphite condensers, graphite falling film absorbers and graphite evaporators.